Like I said above. Add the child at the final booking page under "additional guest." That is also a workaround for those properties that have variable points and try to charge you more points for (unbelievably) the second guest. Like I said above. Add the child at the final booking page under "additional guest." no additional guests I’m using the app so I’ll try on my desktop when I get home? I think it isn't on the app IIRC. EDIT: I take that back .It shows on my app. Pics too damn big on computer. Wouldn't it be great if we got people power to work here. Half of us threaten to cancel our reservations unless they bring down the price of the transfer to a reasonable level. I don't mind paying high prices but, like @Stivelio says, this 1hr yacht ride for almost 2k just crosses the line! They're probably peed they don't have enough beach space to hold a gala and can't take all the lambs to the slaughter on NYE so are making up for it with this nigh on 2k/couple. uncommonsensical and sambo150 like this. How do you already know, that there will be a buffet breakfast? There a some hotels in the Maldives, that don’t have any buffet at all, only a la carte, for example the Taj Hotels. Or a very limited buffet with bread , pastries, muesli ,fruits, cold cuts and cheese plus a Menu that you can order from, like the Park Hyatt Hadahaa. 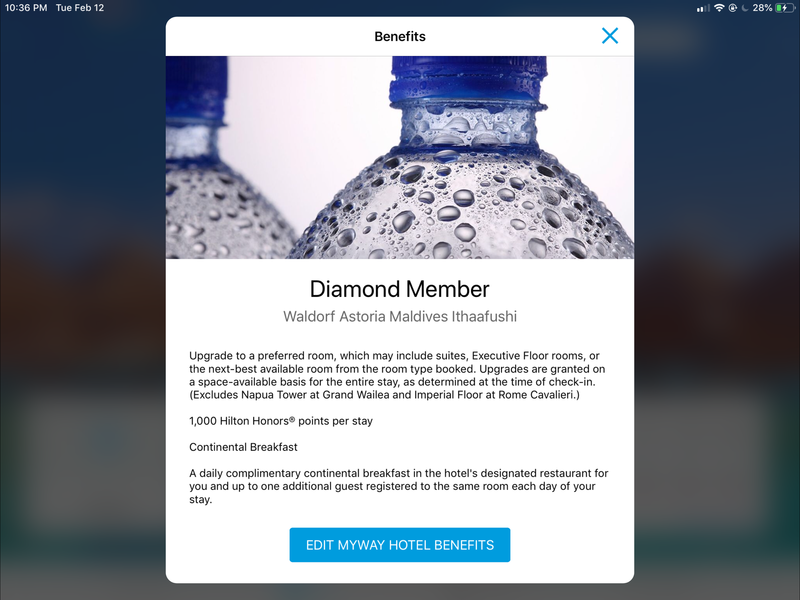 They're not exempt from the Hilton Diamond upgrade policy like Conrad Maldives Rangali Island? Hilton Maldives properties have special powers, i.e; the power not to grant you a confirmed upgrade based on availability. The power to go over the 95K point cap is another example. They could easily deny full breakfast (like we see in the screenshot above). If this is true then they may only be doing this for points bookings. Note that Rangali's online rates have been the same as the W=A's mentioned here, i.e; same rate for breakfast included as another identical rate that doesn't specify breakfast as included - but all cash rates there include breakfast. I suppose we, again, may have to wait for this to be confirmed as the property hasn't decided on these yet. Limited but not that limited. There are various cold cuts and cheeses and there is an assortment of fresh fruit, bircher muesli. muffins, danish pastries etc as well. I'm thinking the same thing. Now doubting whether to add 5 nights onto our trip before the 30 nights at Rangali. I wouldn't go so far as to say a fool and his money are easily parted.....maybe a man with principles and his money are not easily parted. I actually give a hoot about the money I spend because I have to earn it. coolbeans202 and james0499 like this. Is there any way they could exempt Hilton Gold members from the free Continental breakfasts?